A few months back I wrote about Cosmopolitan magazine in my letter for the CMI weekly newsletter (hey, don’t judge … this is for work). In looking through its media kit, I saw that Cosmopolitan reaches a monthly audience of over 14 million women via the print magazine and over 50 million including digital channels. About 60% of the audience reads at least three out of every four issues, and when they do, it’s for an average of 75 minutes. Yes, you read that correctly … 75 minutes. Cosmo is completely focused on the audience. There isn’t one word about what it sells to make a profit. Exxon, on the other hand, has a clear mission around what it sells. Oil … and lots of it. Good for them. Cosmo has made content its business model. Sounds like a media company, right? It should. While traditionally Cosmo’s go-to revenue strategy revolves around selling advertising, Cosmo has a number of flexible options to make money from its content. Create a loyal audience. 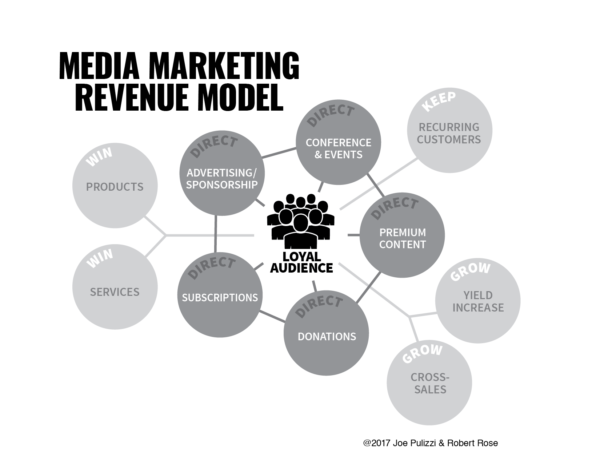 Once we learn the deep-rooted needs of that audience, and deliver value to them consistently and the audience (reader) becomes a fan (subscriber), we monetize that relationship in multiple ways. And Cosmo does, from books to beauty packages to native advertising to syndicated content to promotions. If Cosmo leaders are even half-innovative, they’ll see how many products they could sell directly to their readers (instead of mostly just selling access to advertisers). When that happens, watch out! Robert and I know a number of wonderful people who work at Exxon, but we don’t envy them their task. It’s very challenging for a marketing professional to leverage content with a mission that revolves around the product (and not the customer). Exxon is one of the largest, most valuable companies in the world. It leveraged every bit of traditional marketing and a traditional business model, and came up roses. But if Exxon wants to grow substantially bigger and become a growth company (if that’s even possible), it needs to kill that model. Dennis Publishing is one of the largest independently owned media companies in the United Kingdom. Its big titles include Men’s Fitness and The Week, but it also holds large content platforms in the automotive sector, including brands like Car Buyer and Auto Express. Over the last 10 years, most media companies have struggled to grow significantly, as print advertising continues to die a slow death. But this hasn’t affected Dennis. According to The Guardian, Dennis Publishing has increased revenue 63% from £59 million in 2009 to £93 million in 2016. How, you ask? In November 2014, Dennis acquired the online car dealer BuyACar, which now generates 16% of the media company’s total revenue. That’s correct. This little media company sells over 200 cars per day. Dennis has the audience (interested car buyers) and formed a loyal relationship with them over time. In hindsight, it was a no-brainer move for Dennis to buy an online car dealer or e-commerce company, but yet few media companies see this as a possibility (for now). Is Dennis a media company or a brand that sells products and services? How about Red Bull or Johnson & Johnson (which runs Babycenter.com)? Celebrity Gwyneth Paltrow launched Goop.com in 2008. Originally conceived as a weekly e-newsletter on travel recommendations and shopping tips, Goop quickly attracted over 1 million e-mail subscribers. Once Goop developed a committed, loyal audience, it started launching products and, in 2016, announced and began selling a full clothing line. Is Goop a media company or a brand that, for now, sells fashionable clothing? What might it sell five years from now? Today, if you had to choose between creating an audience and then directly selling to that audience versus renting outside channels that you don’t control and don’t own, which would you choose? Of course, you’d go direct. It’s an incredibly easy decision to make, and yet, most companies have been choosing to rent (primarily) year after year. We keep sustaining, as Robert often states, an “inefficient” system like it is the only game in town. We’ve been led to believe that our current marketing is the hand we’ve been dealt, and there’s nothing more we can do. The purpose of this article is to get you to rethink your purpose as a marketing department. As marketers, we become so focused on leads and funnels and scoring that we sometimes forget what’s possible. Maybe, instead of hawking a product, your goal as a marketing executive is to build a real relationship with your buyers, which then has the potential of making markets (isn’t that the purpose of marketing?). 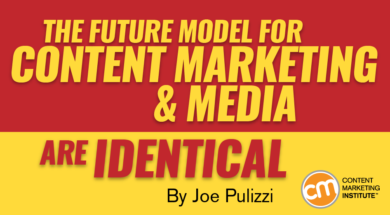 The new media business model and the new marketing business model are exactly the same. Media companies have historically focused on the five direct-revenue paths, as noted in the figure above. Brands that sell products and services have focused on the outside five or indirect paths to revenue when building a loyal audience. Our contention is that marketers (as well as media executives) need to open their minds to all 10 possible revenue opportunities, and that if you don’t, your competition will. Right now there is a clear opportunity for any company in any industry of any size to make this happen. Will you? Want to buy one of the first copies of Killing Marketing? It will be released at Content Marketing World. Register today to attend the Sept. 5-8 event in Cleveland, Ohio. Use the code BLOG100 to save $100.